The restaurant is open for pre/post theatre and evening service. Tucked beneath The Phoenix Theatre lies our charming escape from the London norm. 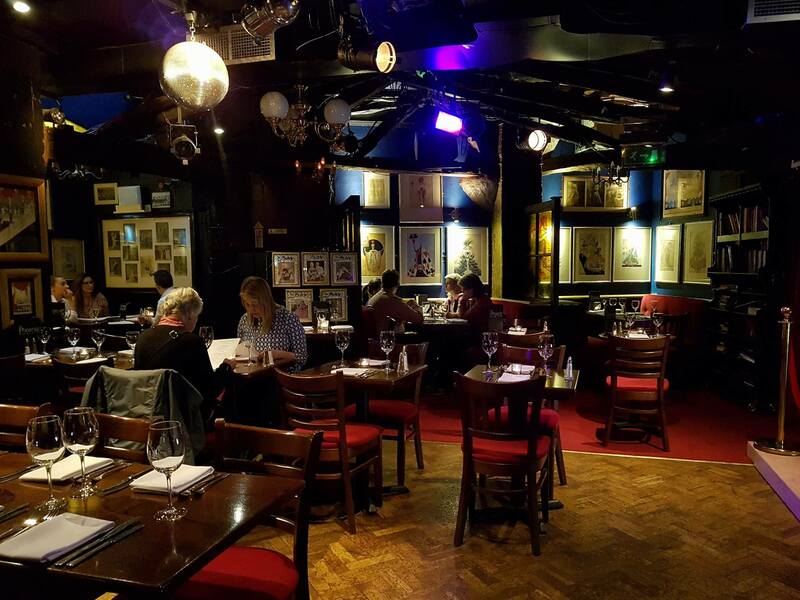 Our lively and nostalgic theatre bar & Restaurant is located in the original dressing and rehearsal rooms of The Phoenix Theatre where Laurence Olivier made his debut in the 1930s in "Private Lives" with Noel Coward & Gertrude Lawrence. With fascinating signed posters, paintings and pictures from decades of theatre productions, a restored art deco interior and hidden treasures in every corner, there's something new to see on every visit, and you never know who might decide to give an impromptu performance! Non-members welcome by reservation made online, on the phone or by email. Subject to availability. By securing a restaurant reservation, you and your guests are granted temporary membership to The Phoenix Artist Club for the duration of your visit. Celebrity Head Chef, Robert Kusy only uses the freshest locally sourced, responsibly farmed produce. A lovely place, staff were really friendly and helpful and explained all the choices (courses-wise) immediately. Food was amazing and I was really pleasantly surprised at the very decent price. Only negatives I could mention were that the atmosphere in the restaurant area was a little jarring (it being dark and with the disco ball rotating) and I wish there had been even one more vegetarian main option on the menu (the tagliatelle was really tasty, I'm just not a big fan of mushrooms so personally I would have liked something slightly different had the option been available, and the menus on the restaurant website are outdated so even checking beforehand I had no way of knowing what the only main course option for me would be). Otherwise we had a lovely meal and would definitely recommend to others! Great food and entertainment. Meet interesting people in a very enjoyable atmosphere. We were pleasantly surprised by the presentation and quality of the food. The pre-theatre option was a great value! Reserve early...it crowds up. Excellent food and friendly staff but service was quite slow. The food was excellent, and the staff were friendly and efficient without being pushy. Consequently we were able to have a pleasant three course meal comfortably in time to see the show in the theatre above. Will recommend and return in the future! Lovely food. Great service. Excellent 3 course ore theatre meal. If you are do the pre dinner theatre menu arrive earlier than 6pm. The service was slow which meant we didn’t have time to have our dessert. when we asked the server to take it off our menu they charged us £14 for just a main. Two courses is £16.50. When I questioned it they took off the service and after another complaint they took off 20%. If you’re going to offer a pre-theatre menu and service then timing is of the essence! Customers have shows to see. Had post dinner drinks after the Theatre which was next door,never been before but am definitely going to go more often,great bar and the food was delicious....I highly recommend it! Excellent fresh food and good service. Definitely would visit again. Perfect place for dinner before a show. We love coming to the Phoenix Arts Club but were disappointed when we came to order our food. Not until we had looked at the menus and asked for our orders were we told what was not available. My partner wasn't able to have his first or second choice starter and then he wasn't able to have his first choice main course. We understand that restaurants run out of food but please don't wait until we have looked at the menus to tell us. Had a birthday dinner here with 10 people. Service was terribly slow even though the restaurant was not busy at all (4-5 tables maximum). Between being seated and receiving our mains it was nearly 2 hours. The staff left our table unattended for 45 mins, we had to wave down a waiter for more water/wine. Food was fine, albeit bland, but the wine was cheap and we enjoyed the show tunes from the man on the piano. Loved it. Food was very nice and good portions and a lovely ambience. Have already recommended it to friends. Staff hugely welcoming and really professional. The food and service were better than most. Our waitress was exceptional. Got us out 15 mins before showtime. The room is wonderful. Perfect pre-show setup - could not ask for more. Wonderful start to our evening at the theatre seeing the amazing Come From Away. Delicious food and great staff. Planning another visit. Great pre theatre get together. Thank you!